New Designed by Patented Product. It is a must-have accessory for anyone wanting to improve their filmmaking skills with a phone that shoots better images than many high end cameras. New Designed by Patented Product. It is a must-have accessory for anyone wanting to improve their filmmaking skills with a phone that shoots better images than many high end cameras. You can mount the Rig on any tripod but if you go handheld, it allows you to capture relatively smooth shots. 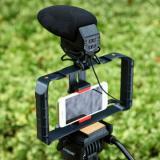 • Great Design for Filming on the Go with your smartphone. Get a Smooth Video and take steady shots and capture unique life’s experiences. • With the Universal 1/4"-20 tripod thread at the bottom,You can Mount it on the Video Tripod, Slider, Jib and Stabilizer, it is a must-have smartphone Video Rig for Professional VideoMakers like you. • New U Rig Pro with 3 Standard Shoe Mounts and 2 Universal 1/4"-20 threads, you can mount LED lights and video microphone on the Rig. A Fantastic tool for mobile video makers. • Compatible with iPhone 8 plus, iPhone x, Samsung, Huawei Most smartphone with or without a case from 2in to 3.5in wide. 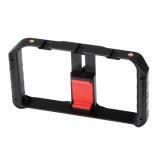 Not only the Spring Clip, but also with a secure screw to screw your phone. A must-have Rig for your phone. I use the ulanzi Smartphone Video Rig with an iPhone 7. I also an iOgrapher product that perform the same function for my iPad Air 2. The ulanzi compares well to the iOgrapher and is a better fit for the iPhone 7 at this time. The product is well made, sturdy and easy to adjust. The moving components look like they'll hold up to constant use. I really like the fact that it has a metal threaded tripod mount on three sides so my phone can be used horizontally or vertically. the design Is not only simple but practical. It can be held in your hand or on a tripod. I added Velcro strips to the bottom to mount batteries to control lighting and power the camera for a long shoot. You cannot get a better product for this type of quality for this price anywhere. I have used this Stabilizer for more than 3 months now and it is still going strong. This is a great addition to your gear if you are into video recording. You don't need a super high tech gear as long as you provide high value with your content. 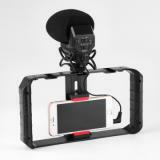 Just go ahead get you smartphone and set it up with this stabilizer and you will have professional looking videos. Great price and good quality! The rubber grip handles are super comfortable and the frame is well built. Holds my LED light mounts and gopro camera perfect. Can't wait to dive with this setup! I bought this so both my writing partner &I could quickly produce short videos using our phones. I have an iPhone but she has a Samsung so I wanted to get a camera rig that would could both use.